After paying $75 to fill his black Dodge Ram pickup truck for the third time in a week, Douglas Chrystall couldn't take it anymore. 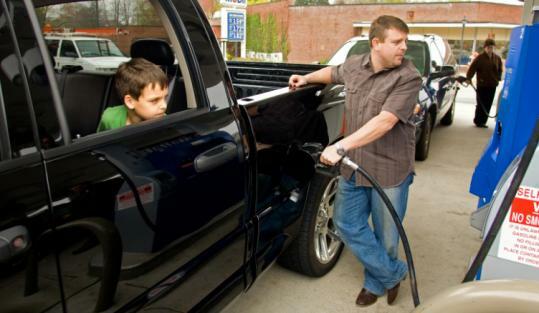 Feeling pinched at the pump, and guilty as well, Chrystall, a 39-year-old father from Wellesley, is putting ads online to sell the truck, and the family's other gas-guzzler, a Jeep Grand Cherokee. He knows it will be tough to unload them because he is one of a growing number of consumers downsizing to smaller, more fuel-efficient cars. Americans are turning away from the boxy, four-wheel-drive vehicles that have for years dominated the nation's highways. Sport utility vehicles and pickup trucks - symbols of Americans' obsession with horsepower, size, and status - are falling out of favor as consumers rich and poor encounter sticker shock at the pump, paying upward of $80 to fill gas tanks. The sale of new SUVs and pickup trucks has dropped precipitously in recent months amid soaring gas prices and a weakening economy: SUV sales for the month of April alone fell 32.3 percent from a year earlier and small car sales rose 18.6 percent. This fundamental shift comes against a backdrop of relentless gas increases, and growing concerns over the environment and US oil consumption, according to auto analysts and car dealers. "The SUV craze was a bubble and now it is bursting," said George Hoffer, an economics professor at Virginia Commonwealth University whose research focuses on the automotive industry. "It's an irrational vehicle. It'll never come back." With stocks of unwanted new SUVs and pickups piling up at dealerships across the country, automakers are offering unprecedented promotions. Incentives for large SUVs, including cash rebates, topped $4,000 in March, or more than double those offered in March 2002, according to Edmunds.com, which monitors the motor industry. At the same time, consumers like Chrystall are flooding the market with used SUVs, trying to trade in hulking Hummers for compact Corollas, and getting thousands of dollars less than they would have just a few months ago. In April, the average used SUV took more than 66 days to sell, at a 20 percent discount from vehicle valuation books, such as Kelley Blue Book, compared to 48 days and a 7.8 percent discount a year earlier, reported CNW Marketing Research, an automotive marketing research company. Some desperate car dealers and consumers, are willing to lose thousands of dollars just to get rid of their SUVs. Last July, 20-year-old Sannan Nizami, of Lowell, bought a 2007 Toyota 4Runner SUV for $32,000 when it cost about $65 to fill the tank. Six months later, as a gallon of gas soared to $3.50 and more, and tank refills climbed over $80, Nizami put the vehicle up for sale. He posted it online for $27,000 but received no responses for months. Frustrated and unable to afford prices at the pump, Nizami last month turned over the Toyota to a dealer who only sells vehicles from private owners. Nizami is still paying the $450 loan but now is bumming rides to work with a cousin and worrying about making enough from the sale to cover the car loan. "I didn't think gas would shoot up this much. I'm willing to take a hit just to take the pressure off," Nizami said. "I'll probably get a really cheap Camry or Corolla. Something that gets more than 18 miles to the gallon." The slowdown in the home construction industry has also lowered demand for used SUVs and full-size pickup trucks. Meanwhile, midsize and small domestic 4-cylinder vehicles have fetched higher used prices during this period of high gasoline prices, according to Paul Taylor, chief economist for the National Automobile Dealers Association. For example, wholesale prices of used small cars increased from $8,480 to $9,240 between December and March as gas prices rose from $2.98 to $3.22 per gallon. The growing popularity of crossover vehicles, which offer SUV features on a car platform, is putting a dent in SUV sales and reshaping the focus of the auto industry toward the more fuel-efficient crossovers. In March, twice as many crossovers were sold compared to SUVs, according to the auto dealers association. Herb Chambers, who owns more than 40 dealerships across Massachusetts and Rhode Island, said the incentives offered on new SUVs are pushing down the value of the used vehicles, and increasingly, he is taking a loss on SUV trade-ins at his various dealerships, which include everything from Chevrolet to Jeep to Mini. "The incentives have never been higher than they are today for the large SUVs and small pickup trucks," Chambers said. "I don't know how factories can make any money for these cars." At his Mini dealership, Chambers said people have been turning in Chevrolet Suburbans for the tiny British car in recent weeks. He currently has a one-year waiting list for the coveted Smart Car, an 8-foot-8-inch vehicle that gets more than 40 miles per gallon. "Having SUVs as an everyday commuter car is largely going away," Chambers said. Jon McHugh, of Swampscott, is celebrating the last payment on his 2003 Acura MDX by putting the SUV up for sale. He had expected to drive it a year longer, but rising gas prices and growing economic uncertainty made him reconsider. Plus, McHugh recently reacquired a taste for the convenience of a smaller car. Whenever possible, he drives his wife's new Civic Hybrid, which costs half as much as the Acura to gas up. "I don't need this much space," McHugh said of his SUV. "It just seems ridiculous." Jenn Abelson can be reached at abelson@globe.com.